Let’s start from the book. “Harry Potter and the Order of the Phoenix” is the longest and the most somber among all five ones, but it has already broken all possible records! The first edition of Phoenix was issued in 13.5 million copies. There are a lot of replies to this film, both positive and negative. People may say anything they want, but I have really enjoyed this film. Frankly, I’ve watched all previous parts more than once and I have also read all books. Of course the script differs from the last book, but truly, the book was very long. Screenwriter Michael Goldenberg and director David Yates, a veteran of British TV, have boiled down the longest of J.K. Rowling’s novels (870 pages) into the shortest of the films about Harry. I knew that the 5th book is the longest among others, so I expected with dread, that the movie would not comply the full scenario of book and that many parts would be just cut off. But I was truly surprised. And I should say that this part is the best! Firstly, it is very close to the book. Secondly it has great special effects and good acting. My brother told that if the director had shot this film according to the book, it would have become too long and boring. If somebody doesn’t understand the idea – read the book! Ultimately, films and books are two absolutely different genres of the art. I should also notice that all young actors have become more professional. Now they are not just happy kids, but they are teenagers with rich life experience: they have overcome the death of their best friends, the betrayal, the meanness and the mortal danger. Some people say that they have expected more from the first kiss of Harry with Cho Chang (Katie Leung). This scene had 24 takes, but the result is not so convincing and “interesting”. Some were disappointed because of the lack of sexual scenes. My own opinion is – it’s too early, let’s wait for the next part! They are still kids. And this movie is a little more somber than previous parts. It is not more a fairy tale for kids. But this film also has many good sides. Anyway, I’ve enjoyed watching new artists and my beloved ones from previous parts. I like new Harry’s classmate Luna Lovegood. And I think this strange girl is exactly like in the book! 100% direct hit to the mark. I hope we’ll see her in the next parts. By my own point of view Helena Bonham Carter as the mad cousin of Sirius Black is the most promising addition to the cast, but she shows up only as a teaser for future installments. This actress was born to play the role of a witch, because she looks really great. Maggie Smith, Emma Thompson, Gary Oldman, Jason Isaacs, Brendan Gleeson, Robbie Coltrane, David Thewlis and Julie Walters, among others, punch in for perfunctory paycheck appearances. Also seriously shortchanged are Emma Watson and Rupert Grint as Hermoine and Ron, who in the book have a serious conflict with our hero. I also liked amazing views of night London – House of Parliament and Tower Bridge are really worth to be the decorations for such film. Talking about special effects, if you want to receive the maximum doze – go to IMAX movie theatre. You will feel the effect of presence. 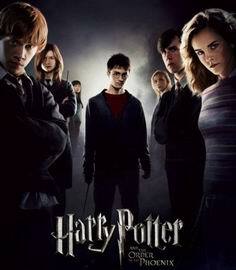 I will never stop loving each personage of this great book, I will never forget them. Novels about Harry Potter do not just narrate the story, but they really learn. Kids enjoy this book, they enjoy this film, because they don’t see any false in it. J.K Rowling wrote the book for her kids, but in actual fact it is for many more generations. In conclusion I should say great “Thanks” to all those people who worked on this film. The achieved the goal to make the tale come alive. It was something amazing! Of course not every one will like this film, but those who have read the book “Harry Potter and the Order of the Phoenix” will surely appreciate this film at its true value. Anyway, every man has his taste. I strongly recommend you to watch this perfect movie. I promise – you’ll spend great time! This entry was posted on Sunday, November 18th, 2007 at 6:18 pm	and is filed under Film Review. You can follow any responses to this entry through the RSS 2.0 feed. Both comments and pings are currently closed.